As per usual, I wanted to cook a simple healthy meal and came across this recipe on epicurious. The beauty of this particular salmon dish was that it required no complex ingredients, the prep time was only a couple minutes, and it pairs well with so many side dishes. 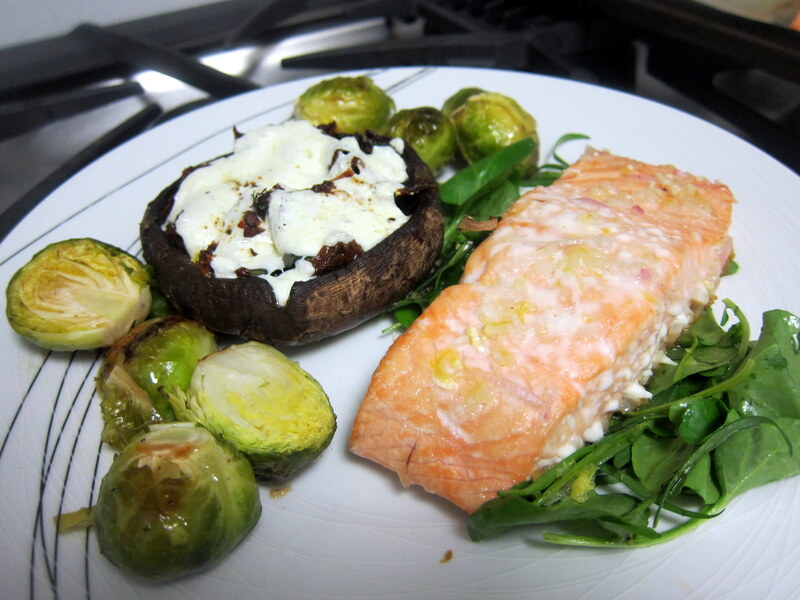 I chose to serve the salmon with Portobello Pizzas and Roasted Brussels Sprouts because they all have approximately same roasting time. So I prepped everything and then let the oven do its magic while I imbibed on some wine. The results were awesome. 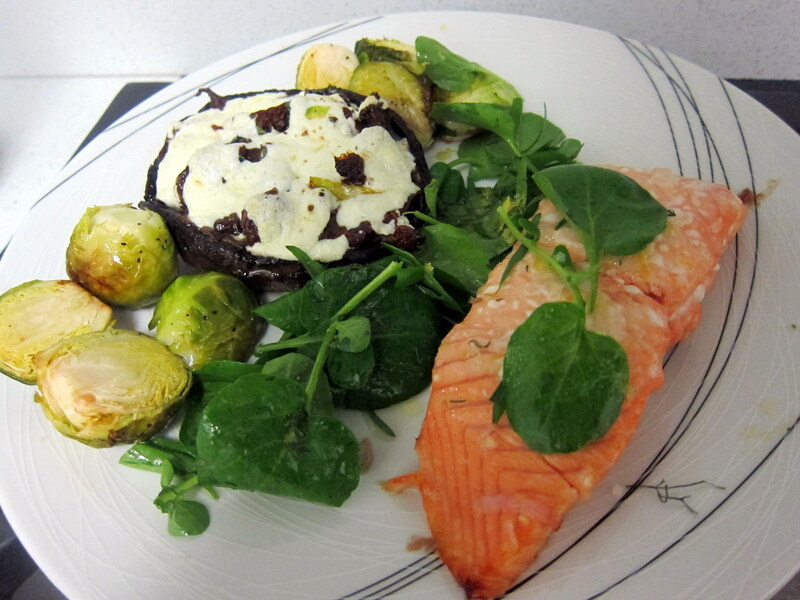 Bonus points: I got to use basil, dill, and tarragon from our Aerogarden in this meal! Whisk crème fraîche, 1 tablespoon lemon juice, and 1/2 teaspoon lemon peel in small bowl. Season with salt and generous amount of pepper. As mentioned above, I skipped the first part of the recipe. I did, however, mix lemon juice, lemon zest and some olive oil (just eyeballed the measurements) to dress the watercress salad (you’ll see in a later step). Whisk honey, 1 tablespoon olive oil, shallot, 2 tablespoons lemon juice, and remaining 1/2 teaspoon lemon peel in 11x7x2-inch glass baking dish. Add salmon fillets and turn to coat. 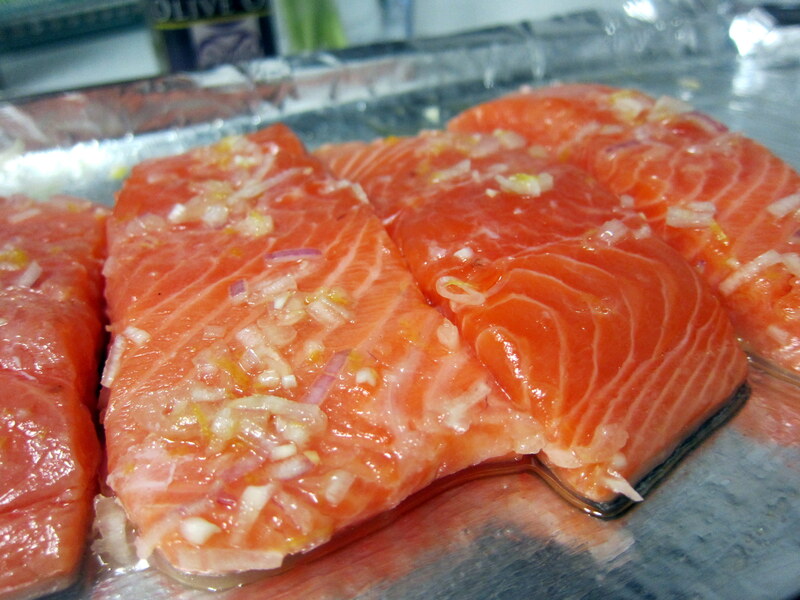 Cover and chill at least 15 minutes and up to 1 hour, turning salmon fillets occasionally. Position rack in top third of oven and preheat to 400°F. Line large baking sheet with foil and brush with olive oil. Transfer salmon fillets, with some marinade still clinging, to lined baking sheet. Roast until salmon is just opaque in center, about 14 minutes. Meanwhile, toss watercress leaves and sprigs, dill sprigs, tarragon leaves, remaining 2 teaspoons lemon juice, and remaining 2 teaspoons olive oil in medium bowl. Season to taste with fleur de sel and pepper. Place 1 salmon fillet on each of 6 plates. Serve on top of or topped with watercress salad, Portobello Pizzas and Roasted Brussels Sproutsor a side dish of your choice! Bon Appétit! I am so there with this delicious recipe. So wantto eat salmon today . The sauce sounds fantastic! The salmon looks so lovely!